With work on surgical robotics happening daily at the University of Nebraska-Lincoln College of Engineering, students will reach new heights -- literally 35,000 feet -- to conduct research for NASA on robotic surgery for space travel. A UNL engineering team will return for its seventh year with NASA's Microgravity University later this spring, this time studying the effects of microgravity on robotic capsule endoscope (RCE) propulsion and tissue adhesion techniques in the small intestine. "RCEs are pill-shaped devices used for non-invasive imaging and performing simple surgical procedures while they travel through the human bowel," said Ben Terry, assistant professor of mechanical and materials engineering. "With long-distance space flights, having a surgeon on missions is not typically possible but miniature surgical robotic technology could make emergency on-board procedures feasible for astronauts." Terry, who specializes in minimally invasive surgical tools and processes, advises the UNL microgravity team, with Carl Nelson, associate professor of mechanical and materials engineering, and Dustin Dam, a student on UNL's 2008 microgravity team who works with the Department of Electrical Engineering. Team leader Piotr Slawinski, a post-baccalaureate mechanical engineering student from Warsaw, Poland, said the Nebraska experiment aims to attach a biosensing device onto a synthetic intestine and study the device's ability to attach and resist the bowel's peristaltic motion. Slawinski completed his bachelor's degree in December and will start graduate studies this summer. The biosensor will allow noninvasive diagnostic readings without astronaut interaction and enable detection of conditions such as obscure bleeding, inflammatory bowel disease, irritable bowel syndrome or Crohn's disease. NASA Microgravity University conducts scientific research that helps the U.S. space program. Projects are prepared by students with mentoring from NASA and industry representatives, then conducted during "Flight Week" aboard a series of high-altitude parabolic flights in specially-equipped aircraft. The UNL team's research proposal was accepted by NASA earlier this winter, with the Nebraska team's Flight Week slated for May 30-June 7 at Johnson Space Center in Houston. 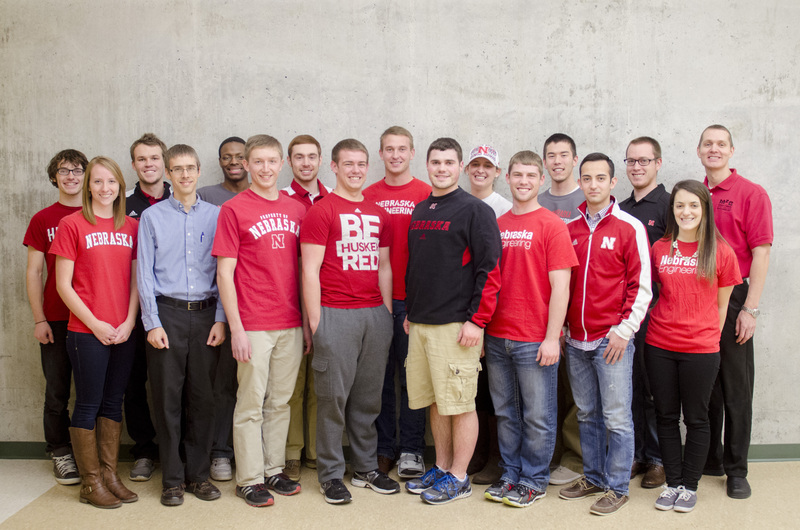 For more about the UNL microgravity team, go to http://www.microgravity.unl.edu. Following is a list by hometown of team members with their academic year and major. Bellevue: Blake Stewart, junior, mechanical engineering. Blair: Tricia Foley, senior, electrical engineering. Columbus: Shawn Schumacher, senior, mechanical engineering. Lincoln: Effie Greene, senior, mechanical engineering. Papillion: Christian Laney, senior, electrical engineering. Roca: Ethan Monhollon, junior, biochemistry and biological systems engineering; Luke Monhollon, freshman, biological systems engineering. Schuyler: Alfred Tsubaki, senior, mechanical engineering. Superior: Ty Rempe, sophomore, mechanical engineering. Wayne: Sawyer Jager, sophomore, computer engineering. York: Weston Lewis, junior, mechanical engineering. Eagle River, Alaska: Erik Moore, senior, biological systems engineering. Fort Collins, Colo.: Maggie Clay, junior, biological systems engineering. Santa Ana, Calif.: Victor Torres, senior, mechanical engineering. Warsaw, Poland: Piotr Slawinski, post-baccalaureate, mechanical engineering.